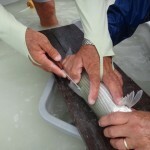 In October, CEI researchers Aaron Shultz and Zach Zuckerman, along with Illinois Natural History Survey scientist and chair of the Fisheries Conservation Foundation Dave Philipp, took a trip to the neighboring island of Abaco to tag bonefish, as part of a Caribbean-wide effort to gain knowledge on the population dynamics and movements of these economically important gamefish. 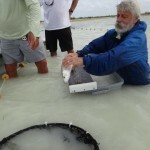 Tagging efforts on Abaco were a huge success, despite having to deal with Hurricane Sandy. Early on in the trip, the team headed out to the Southern End of the Marls and captured several schools of bonefish that came in waves of 50-150 fish. Buddy Pinder, bonefish guide and member of the Abaco Flyfishing Guides Association helped them tag 162 fish on the first day of seining. 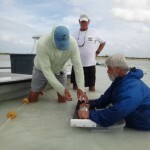 The next day they saw piles of fish moving along the same shoreline and tagged an additional 496 bonefish! One of the fish had been tagged by Aaron two years earlier in Cross Harbour. The team suspects these fish are using this stretch of shoreline as a corridor to the southern end of the island, where fish aggregate prior to spawning.